Mid-Century Danish Modern Glass Decanter. Stylish frosted, hand blown glass decanter from the 60's was designed by Jacob E Bang, Denmark's first industrial designer for Kastrup Holmegaard. 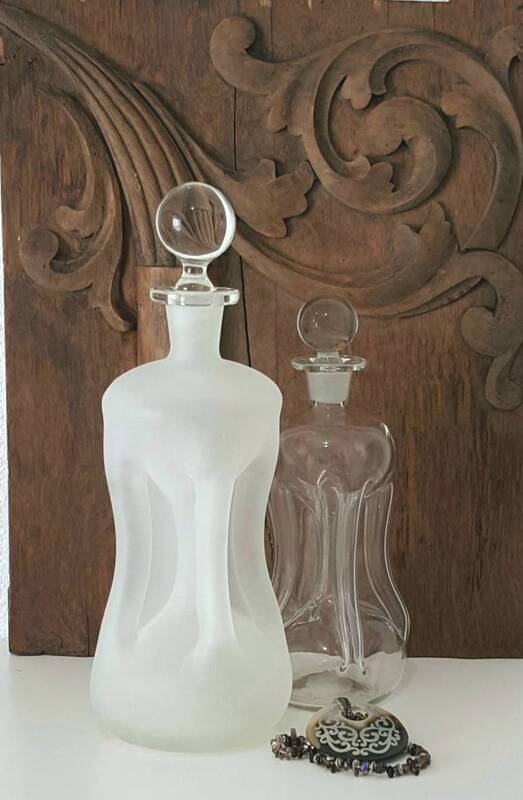 These pinched glass decanters came in different sizes and were named for the noise they make when they pour and comes with the original stopper. The company made different sized versions of this bottle for different uses and were not marked on bottles for content measurements. This design of decanters with the pinched sides was aptly name for the sound they make while pouring. 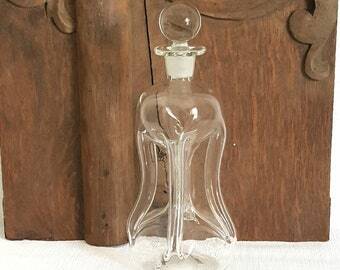 These bottles came in many different sizes and were used to package perfumes as well as liquors. This decanter pairs nicely with the smaller clear one also listed. The company made different sized versions of this bottle for different uses and were not marked on bottles for content measurements Pre 1976. In 1976 all bottles in the U.S.A were required to be marked in metrics. Please contact us if you have any questions. We are always happy to help. 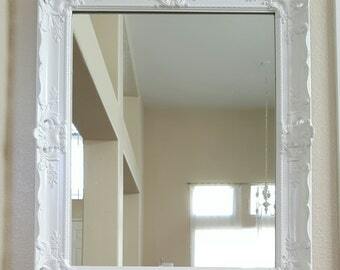 Thank you for shopping CHIC HOME! Vintage GLASS VANITY JAR. Loose Powder, Jewelry or Trinket Box. Diamond Quilted Glass Jar and Lid. Lavender Purple Makeup Jar .